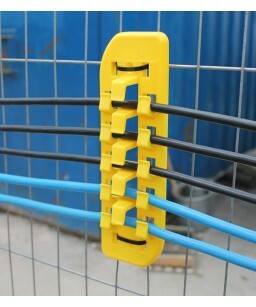 Cabletrail is an innovative, patent protected system for the management of temporary or semi-permanent cables. The unique reverse hook arrangement allows cables to be quickly and easily loaded and locked into a row and held taught between two Cabletrail’s spaced up to 5 meters apart. Cabletrail can be directly surface mounted with two screws or attached to poles and columns with its zip tie features. With additional advanced features such as EID chip location and the ability to laser mark for management or branding purposes, Cabletrail provides the perfect solution to safely handling and managing cable runs in any industrial sector.